Okay, all the fancy words aside, what would it take for me to actually try this thing out? 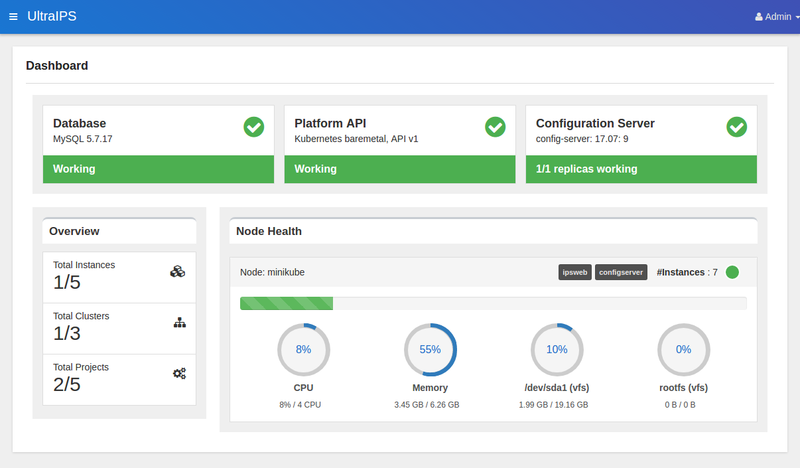 A fully-fledged Kubernetes or OpenShift cluster? An AWS account with a valid credit card? A briefcase of cash to pay for support? Fortunately, none of the above. 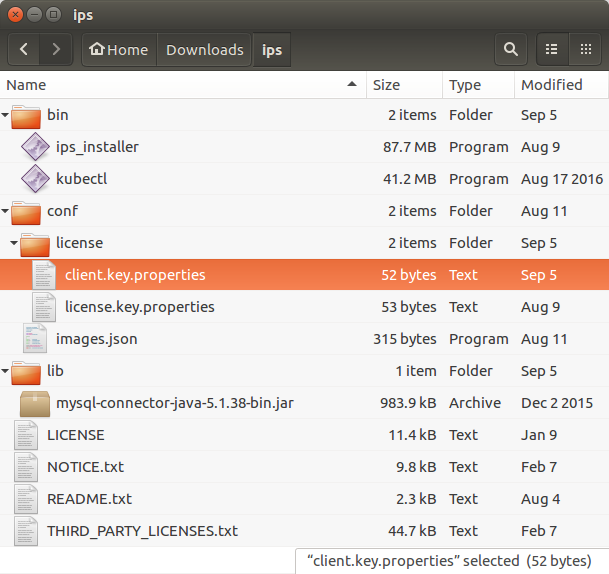 With the DIY IPS Installer you can start up a simple demo IPS set-up on your own machine. All you need is VirtualBox and an internet connection! Hmm, sounds cool…​ How do I start? First of all, ensure that you have the prerequisites in place, to avoid unpleasant surprises later on. Head over to our IPS product page, read all the features, benefits and stuff (kidding) and click the Try Now! button. We have IPS ready-made for Linux and Mac, so pick your choice and click Download. If you’re Windows-only, your journey unfortunately ends here :( at least until we come up with a build for Windows, where we’re facing a few hiccups right now; write to us if you’re interested in getting IPS for Windows, and we’ll give it another go! Oh ho! A contact form! Well, we’d like to know a bit about you so that we can know more about your requirements and possibly help you out with a better solution if it comes to that. Nothing more than a friendly follow-up (and, should you decide to opt in, an occasional integration newsletter). No spam, that’s a promise! Okay, okay, I’m filling it. Wait, what’s this “Docker ID” thing? IPS has some proprietary Docker images, for which we need to grant you access. Hence we need you to have a Docker Hub account (or create one for free if you don’t have one). Enter your Docker ID or username (one that appears on the top right once you log in to the account, or on your homepage’s URL (e.g. mine is https://hub.docker.com/u/malithj/, hence my Docker ID is malithj) in your browser’s address bar) in the corresponding field. Done and dusted, and submitted. What’s next? You shall receive an email from license@adroitlogic.com with a link to download the installer and a client.key.properties file attachment. Click the link, and wait for the download to complete. It would be around 50 MB in size. If you prefer not to do this, you could always run the above command in the current command shell, and proceed with the same shell when running the installer. Next, download the MySQL client library from here, unzip it and place the mysql-connector-java-5.1.38-bin.jar inside lib. This will be used for all database operations inside IPS. Wait…​ Why the heck do I have to download the MySQL JAR? Why don’t you ship it with the installer? Unfortunately, Oracle’s licensing model associated with MySQL prevents us from shipping it with our product. Hence the most logical way is for you to download it on your own (with your own consent); in fact this is exactly how others like Confluence have decided to play the game, and rest assured that you (the user) are not violating any terms, conditions or licenses in playing it this way. Done? Then you’re all set! And type ips_installer start and press Enter (or hit Return, whatever works for you)! The installer will first download a “Minikube ISO” (unless you have run Minikube or IPS installer on the same machine before), and proceed with creating a Minikube virtual machine which will eventually be transformed into your own IPS instance. Now there’s the catch; though the installer itself was less than 60 MB in size, the Docker images are the ones that really do the magic (and hence weigh more). But don’t worry, this download is one-time (unless you somehow happen to delete the VM and re-create it). So go ahead; type Y and press Enter. That’s it! I quit! Why the **** are you asking for my password?! Earlier, when you filled your Docker hub ID into the contact form, we secretly granted you access to our secret ingredient — ​the IPS Docker images. Now, in order to access them, we need to authenticate Minikube’s Docker process (daemon) to act on behalf of you so that it can download those images. This is why we need your login info. We won’t store your username or password under any circumstances, or transmit it to anywhere other than Docker Hub (more precisely the Docker daemon) itself, you have my word on that. And once the above commands have finished executing, switch back to the installer and provide a fake password. Once you provide the credentials, the installer will start pulling (downloading) images into the machine, which would take a considerable time (depending on your internet connection bandwidth). So go and help yourself to some snacks and coffee. to get hold of the IP address of the VM. It would most probably be something like 192.168.99.100. Now open your favourite web browser, type in https://, followed by the above IP address, followed by :30080 (e.g. https://192.168.99.100:30080) and press Enter. 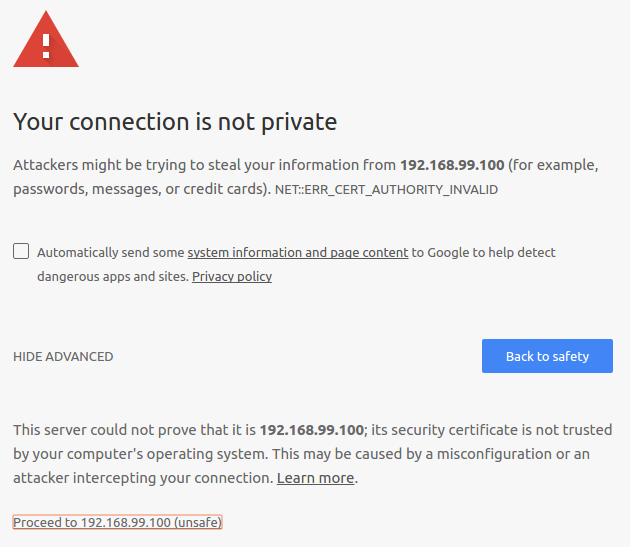 We have a self-signed certificate for the IPS web console, which is why the browser is creating a bit of a fuss. For now, click Show Advanced > Proceed to 192.168.99.100 (unsafe). In a few seconds, ye shall see the IPS login page. Login is easy, just type admin for both username and password, and click Sign In. Within milliseconds you will be staring at the main IPS dashboard, with some fancy health and system status indicators. If the 3 indicators at the top of the page (Database, Platform API and Configuration Server) are all green, it’s party time! Congratulations! You have just installed IPS on your own system. Or, if you’re too tired and would like to start off later on, just run an ips_installer stop. Everything would be exactly as you left them after you run ips_installer start the next day.